There are few places in the world that stir up such longings and true joy of Mother Nature than Patagonia…. We arrived at the insanely beautiful Torres del Paine National Park around 5:30 PM, completely blown away by its unforgettable beauty. After taking a few photos near the entrance of the park, we climbed back into our van and drove in utter silence trying to take in the raw splendor of this incredible place. Not long after entering the park, we pulled into the Cascada Expediciones Eco Camp and were instantly greeted by Cascada’s warm staff. The team included Marcelo (the head chef), two Assistant chefs and Rodrigo. Although I had seen pictures of the camp on Cascada’s website, seeing it in person was much better. It was phenomenal and well beyond our dreams and expectations. The Eco Camp is a novel alternative lodging created by Cascada to offer an efficient, luxurious, and earth-friendly option for lodging in the park. 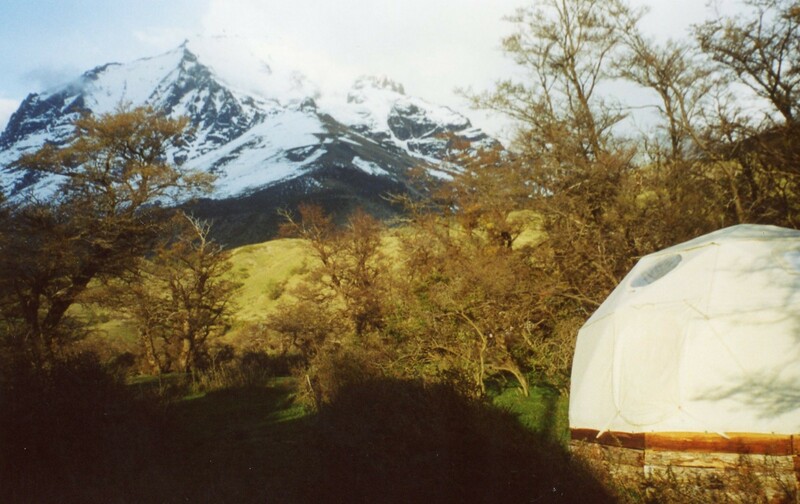 It is the first Eco hotel south of the Amazon and the only one in Patagonia. It’s innovative design uses state of the art environmental technology resulting in a luxurious four-star “camping” experience in harmony with nature. 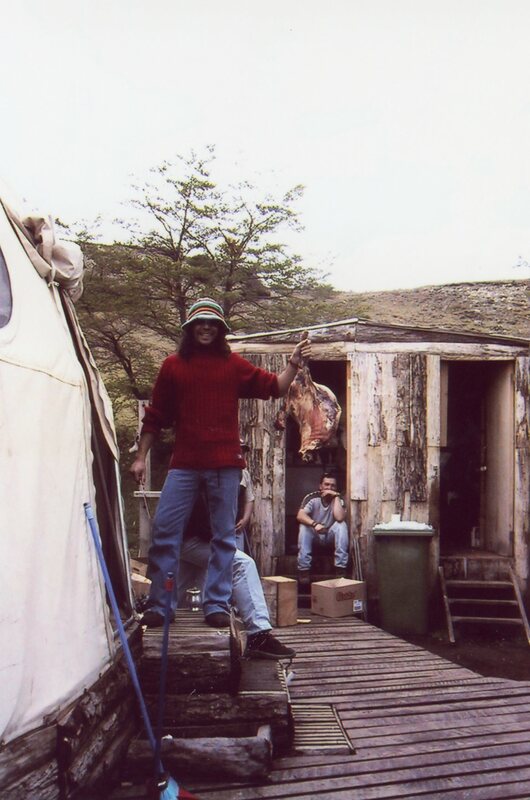 Although you don’t stay at the tent the entire time while visiting the park (one night was camping outside in a tent in the rain while two other were staying jam-packed in a crowded refugio), the three nights we were at the Eco Camp were heaven. The Eco Camp was built a few years before our visit by Cascada in an effort to be more ecologically sound by limiting the impact visitors had on the park and the environment. The Eco Camp is far more than your ordinary campground. There are 16 Eco Tents dispersed around the camp, which are built with a wooden floor and a canvas top. Each ten contains one or two real beds making sleeping a much more comfortable experience after a long day’s hike. There is also a separate hut for the ladies and men’s bathroom, with real live hot showers, a rarity in the trekking world, and efficient toilet systems that create little impact to the environment. 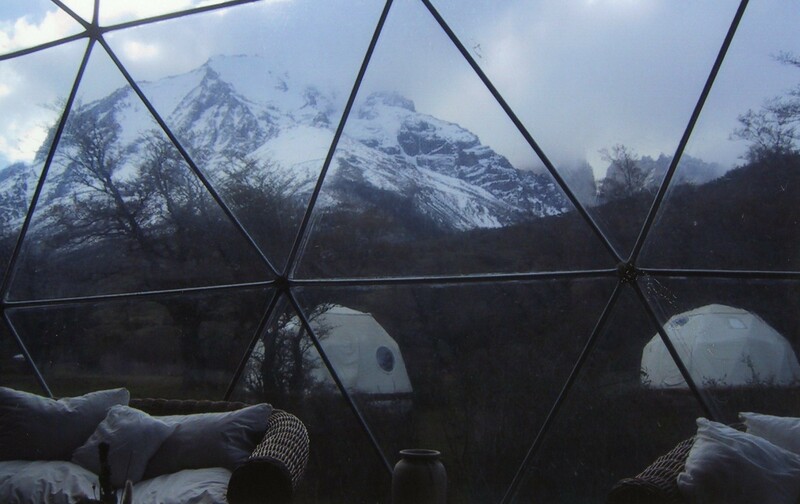 However, in my opinion the highlight by far of the entire Eco Camp is the large Eco Dome which housed the dining and living room for the guests and offers a stunning, panoramic view of the world-famous Torres del Paine (towers) from dusk until dawn. 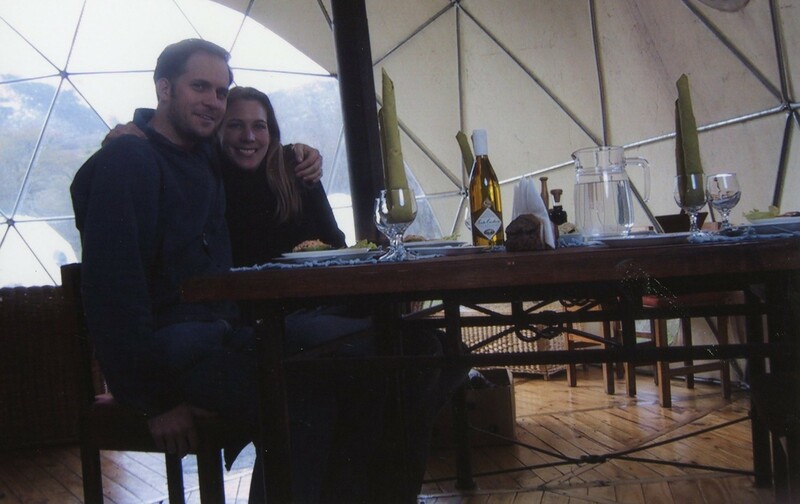 The Eco Dome also contains a full kitchen where delicious home-cooked Chilean meals are served for a sunrise breakfast and candlelight dinners. During a typical week, the Eco Camp can accommodate up to 30 guests. Yet due to our incredible luck, during our week the lodge accommodated just two: Us. Thus the three nights we stayed there, we were waited and dined on by the entire staff in the most amazing, spectacular “tent” I’ve ever stayed in. It was utterly unbelievable. 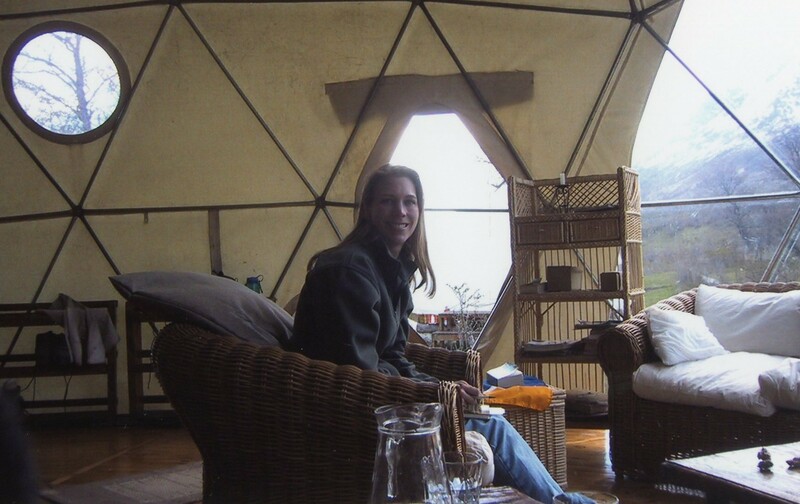 Here is a photo of me standing outside the Eco Dome where our warm fire awaited, a view of the mountains and delightful hot food made my belly ache. 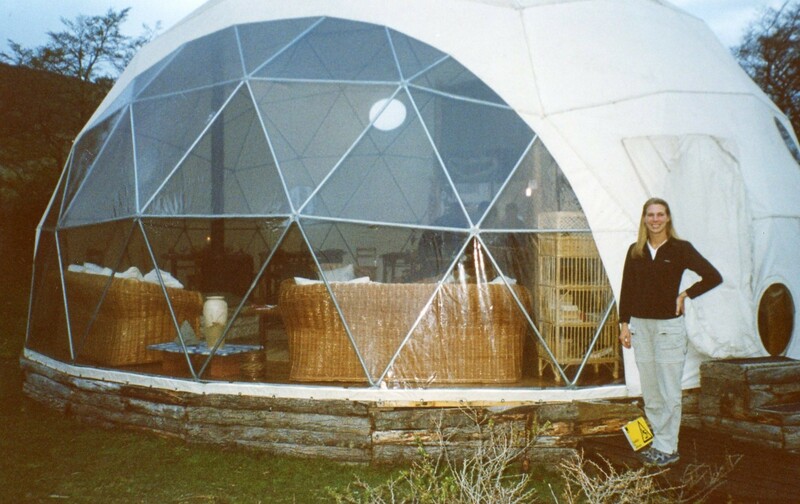 We unpacked a few of our belongings, enjoyed a fresh, hot shower (a pleasure in itself after hours on the road) and then headed to the Eco Dome for the remainder of the night. When we entered the Eco Dome, Cascada’s “cocktails” were awaiting us as well as a warm fire in an antique wood-burning stove. Every night before dinner Marcelo or Cristian would prepare our cocktails. For Cristian, the word cocktails did not mean exactly what one would think. Cascada’s cocktails would always include a glass of the traditional, yet controversial “Chilean” drink called Pisco Sour (there is a fierce battle going on with the Peruvians who claim it as their national drink) and a large assortment of appetizers ranging from different kinds of cheeses, homemade spreads, crackers and always a bowl of lovely olives. We didn’t bother to correct Cristian’s use of the word cocktails since we found it quite entertaining. During the week, cocktails would become a much-awaited tradition after a long day of trekking. Me thoroughly enjoying my cocktails, even though all I did that day was sat in a van! Dinner was served around 8 o’clock and we were amazed to see that it was still light out. In the summer, the sun doesn’t set until well after ten giving trekkers many hours of daylight for exploring. Of course we never hiked that long however it certainly was wonderful watching the sun set while we ate to our hearts’ content. Photo of Marcelo, our chef, preparing tonight’s meal. It was just the three of us for dinner: Me, Paul and our guide Cristian, at our own elegantly decorated table with candles and a magnificent view of the Torres del Paine. Marcelo had exquisitely prepared a delicious four-course Chilean meal, which was served with our choice of red or white Chilean wine (I took some of both!). The entire meal was absolutely yummy and well beyond our wildest imagination. Photo of Paul and I enjoying a wonderful meal of excellent food and conversation. I decided that I could get really used to this kind of lifestyle! As the sun began to set over the splendid Torres (towers), it was time to get some sleep for we had a huge day of hiking ahead of us. I could hardly wait. View outside the Eco Dome at ten pm. It was still light, just like Minnesota in the heart of summer. It was hard to describe my feelings for this magical place. I had written a few words down in my journal which when I look back, years later, on this trip to Patagonia, I believe give it justice: Amazing, spectacular, magical, surreal, special, happiness, peace and most of all, paradise. 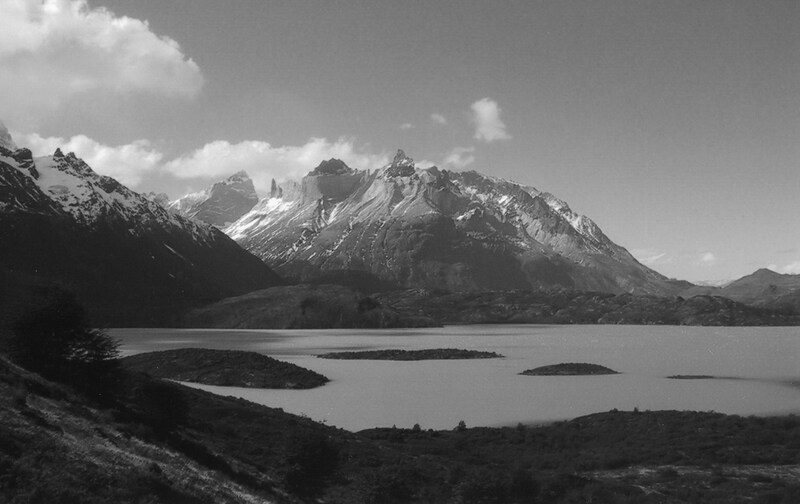 Stay tuned…day one of the “W” hike in Torres del Paine National Park. I LOVE the idea of an eco-camp in Patagonai! Looks and sounds amazing! By the way I love your photos but especially the first dramatic black and white one. Sounds like an incredible place to stay and amazing food! Can’t wait for more about this adventure! Wow! A totally cool Eco Camp overlooking a magical landscape. Those tent and dome designs were just an architectural work of Art with nature as its inspiration. I love each piece of this adventure. Thank you. What an amazing experience! No wonder you have never forgotten it.